5 years at the professional sports level, handful of years spent with other sports teams. Passionate for professional sports and business. Back when I had a full head of hair I was “barnstorming” for the St. Cloud River Bats, a summer collegiate baseball team followed by stints in the MLB and NBA prior to landing with a NFL team. 50+ fully integrated marketing partnerships between the San Francisco 49ers and Memphis Grizzlies with national and international brands. Building relationships and effectively matching brand objectives with creative marketing solutions (i.e. Grizzlies Grannies and Grandpas presented by AARP!). Through a colleague in the sports industry. It is on pace to become the pulse of the sports sponsorship world. 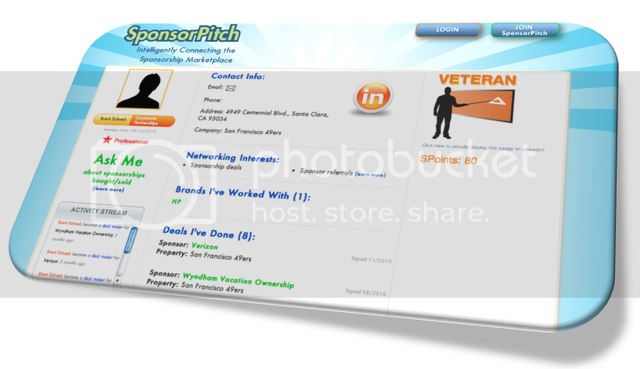 Who doesn’t want to connect with counterparts in the sports sponsorship industry and have legitimate decision-makers at your fingertips?